Dominoes games can be played by two or more people, and set of 55 double nine dominoes is made for four or more players specially. GS marked double nine black dots dominos are excellent tool to help player know the domino games information in advance. 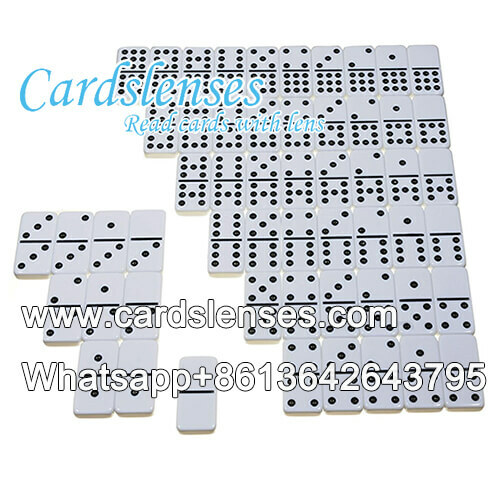 Marking white backs of the double nine black dots dominos with professional invisible ink recipe, the markings are invisible unless player wearing luminous contact lenses or ultra ultraviolet sunglasses that he can read the invisible ink markings in secret and clear, after that, it is very simple for player to make a bet. -Suitable to groups of four or more players. -Includes a set of 55 dominoes. -White tile and black dots.